Allow me to introduce myself, Paul from UK, living and working in Holland and just bought a 1974 250 MK3 Ducati. My first Ducati...... A random conversation over a beer (or two) a few weeks ago and I agreed to buy it, unseen! After a short negotiation, I collect it in four weeks time. Been stood since 1994, been restored once, but looks mostly original. My research has begun during a quiet period here at work. 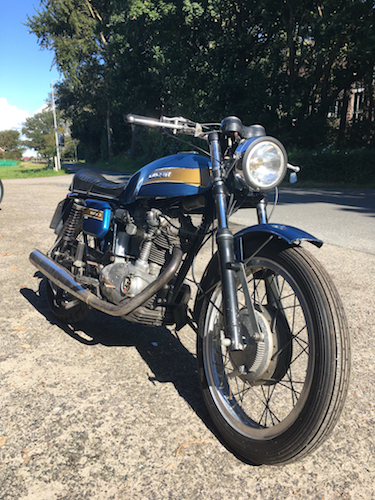 I'm no stranger to bikes, currently have an '81 Yamaha XT500 and a '63 Honda CB72 on the road with a Suzuki TS250 in the initial throes of a rebuild. (not sure of what year it is as it needs to be registered). Once I get a decent picture of the Ducati I will share it with you. welcome aboard, looking forward to seeing photos of your bike. I collect the bike on 23rd July, will post some pictures then. But spent a day checking, cleaning and adjusting everything and it now runs after a 20 year sabbatical! Needs a lot more cleaning and polishing, but mechanically it is solid. nice unmolested bike . looks like a 1974 to me . some of the last bikes to roll of the assembly line . at the very end Ducati run out of single engines and used Spanish Mototrans engines . Correct Eldert, it was registered in 1974. Had it running again this weekend, insured from 1st November so will get some use on dry days.